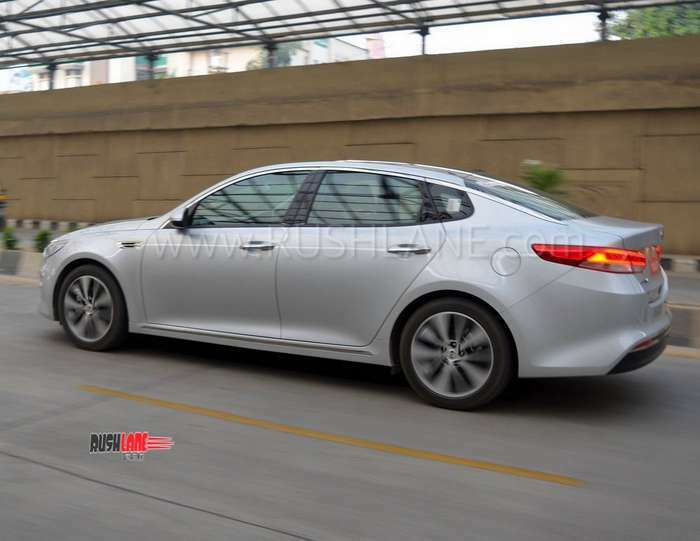 If launched, Kia Optima will rival the likes of Honda Accord and Toyota Camry in India. Toyota just launched the 2019 Camry in India and we believe that it is a perfect time to share our views on one of its global competitors, the Kia Optima. We all know that Kia will be launching its first Creta-rivalling SUV which will be based on the SP Concept in the second half of this year. Also, it plans to launch 5 more products in the upcoming 3 years. 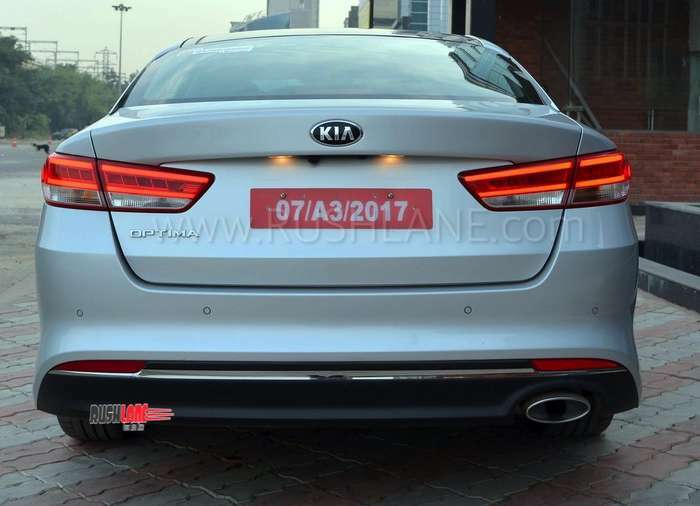 The Optima is a well-known product globally, so irrespective of the fact if it comes to India or not, we thought it will be a good idea to let you know more about this D-Class sedan. Disclaimer: Just like the Rio and Sportage which we had reviewed in the past, the Optima which we reviewed was an imported unit. There is no confirmation if the units which will be manufactured in India (if at all these models are launched) will have the same level of build quality and equipment level. Exteriors – At the front, the Optima wears Kia’s tiger nose grille rather smartly. Probably one of the smartest iterations of Kia’s signature design element! Kia has showered a good amount of chrome on the grille while the headlamp unit looks modern with embedded LED DRLs. Move to the sides and the chrome treatment continues to dominate in the design. There are two chrome strips which run across the length, one on the top of the doors and the other on lower section of the body. Also, the door handles get chrome treatment, however none of it makes it look overdone and the Optima still looks elegant. The rear design is relatively simple, and it hosts swept-back LED taillights. Interiors – Kia has kept Optima’s interiors sporty by having an all-black cabin. 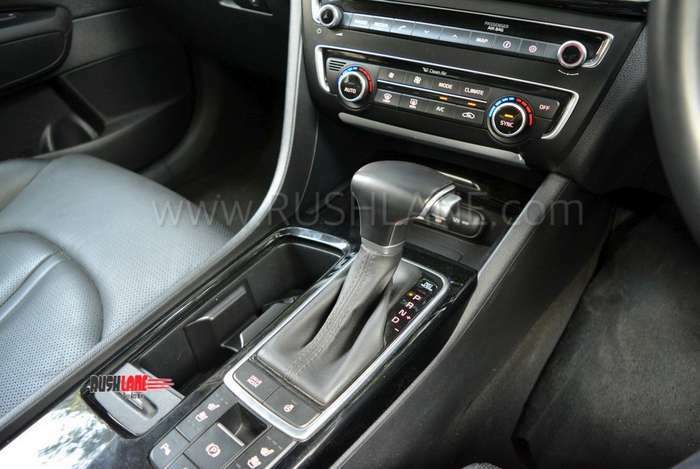 The steering setup looks similar to other Kias which we have seen in the past. Quality of plastics and leather is top notch, hopefully Kia maintains similar level of quality when it launches products in the country. 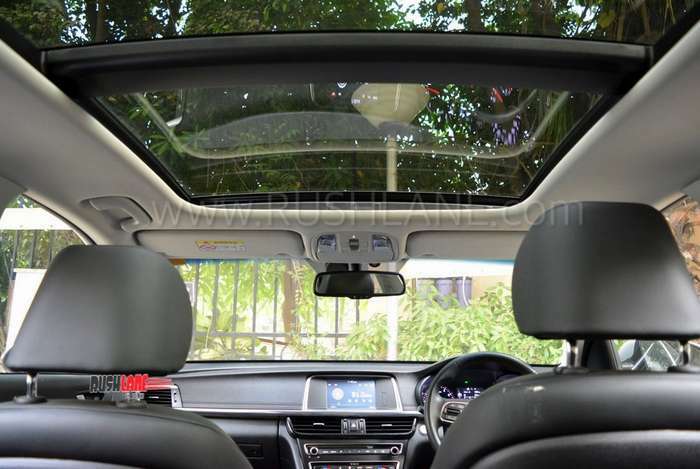 Special mention to the humongous panoramic roof, which will be the largest in its class, provided Kia launches the Optima in India. The Optima comes with a long feature list, probably everything you expect in a car of this segment and a little more. Heated and ventilated front seats, power-adjustable driver seat with memory function, dual zone Air conditioning in the front, heated steering, wireless charging and a lot more are on offer. The car won’t disappoint you in terms of tech and gadgetry, except for the fact that the infotainment unit’s screen size wasn’t impressive (but it did its job well). 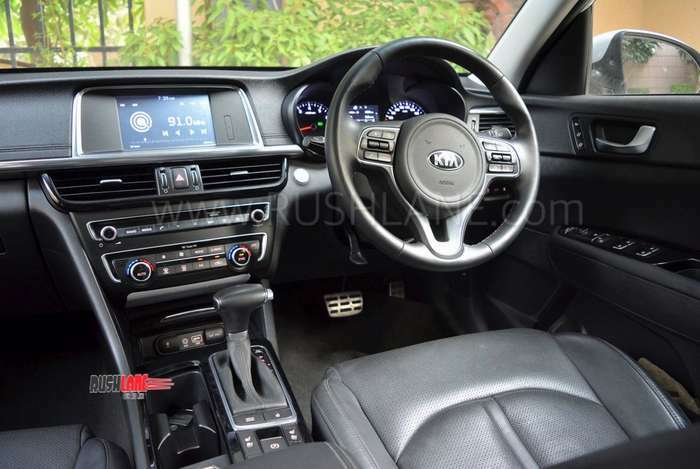 What is interesting is that even though Optima has an all-black cabin, still you never feel claustrophobic inside it. Jump to the rear seats and the plushness continues. There is ample amount of space at the rear, probably second only to the Skoda Superb. Driving Dynamics – The unit we drove came with a 2-litre petrol mill which was tuned to churn out 163HP and 196 Nm of torque. It was mated to a 6-speed auto-box and we had paddle shifters to help us, in case we wanted more control over the shifts. The petrol unit sounded great while the revs built up, however that didn’t mean that it unleashed power in same enthusiasm. The AT is better than the one we experienced on the Sportage but isn’t as swift as you would want it to be. To sum it up, the powertrain is good for your daily drives around town but lacks enthusiasm which you would expect from a 2 litre petrol motor. Ride, Handling & Braking – The sedan might look aggressive from the outside but prefers to be driven in a calm manner, and it is during this that it will impress you the most. Even though it has large 18-inch wheels, the ride quality is soft and comfortable for all occupants, be it at the front or rear. Yes, you can push it around some corners, but it isn’t a car you take for a spin around the ghats. Though the suspension came with a tuning suited for international roads, it still did a good job on Delhi-NCR roads. As far as NVH is concerned, it isn’t the quietest sedan in its class, but it did isolate outside noise pretty well. There are 4-disc brakes, one on each wheel which do their job splendidly! Safety – Being an international-spec unit, the Optima we drove came with a long list of safety features. It had 7 airbags, multiple safety systems like ESC, Hill Start Assist, VSC, Tire Pressure Monitoring system, electronic parking brake and a lot more. Launch & Pricing – Considering the current situation of sales of other cars in the segment, there are slim chances that the Optima will come to India in the foreseeable future. In case Kia plans to launch it in India, it will be priced over INR 32-33 lakhs for sure. There are multiple powertrain options which are available internationally and Kia could bring in a Hybrid option to compete aptly with the products from Honda and Toyota. Verdict – The Optima is a good product in its segment however it faces tough competition from its Asian siblings like the Camry and Accord. The segment has further shrunk due to the availability of multiple German luxury cars in the same price bracket, which might not offer the same amount of value for money but certainly command enormous brand power. 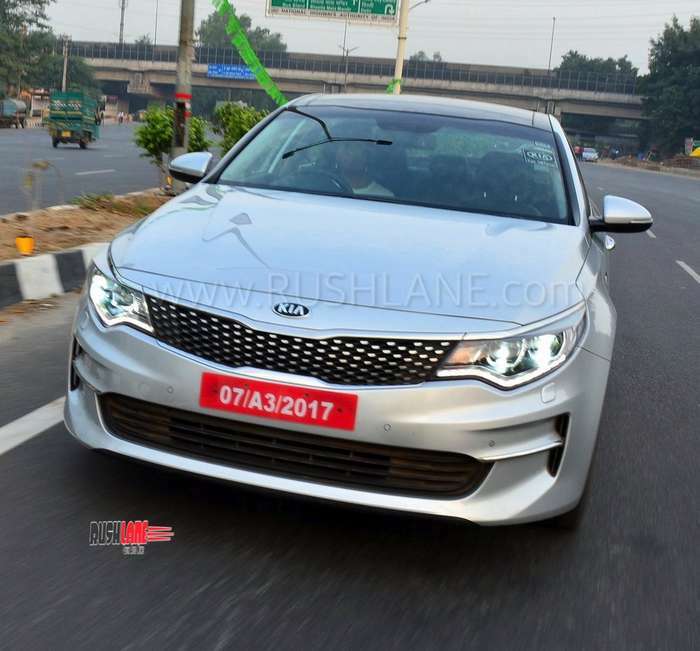 In case Kia plans to bring the Optima in India, it will have to undercut the existing products to get customers to its showrooms.